Web-based services give customers greater flexibility in how the HR and attendance information in the system is accessed and managed. Our optional web-based Employee Self-Service and Web Admin modules offer a cost-effective way to reduce the HR paper trail. Managers and supervisors on the move have all the information they need at their fingertips. Employees can clock in remotely to view their timesheets, rotas and holiday calendars online. IT departments can reduce their workload and costs with Chronologic cloud hosting. Online employee self-service is ideal for employees working off-site, at home, on customer premises or for service teams out on the road. Employees can clock in using PCs, Macs, tablets and smartphones. A growing number of organisations are also finding that giving employee’s more responsibility for managing their own time cuts down on arguments about hours worked and holiday clashes. Employees can view their timesheets and holiday calendars as well as request holidays, Flexi, TOIL and other time-off online. They are also able to see their rotas. You can choose, using GPS, to record the location of remote clockings made by employees using the web or a smartphone to clock in. Supervisors and managers can see the locations employees have clocked in from on each timesheet, (which displays the locations on Google Maps). Managers and supervisors can view and manage clockings, rotas and HR data in real time wherever they’re located. Web admin can be accessed using PCs, tablets, Macs and smartphones. These are some examples of admin and data management that can be carried out on the web. It’s simple to view and edit timesheets online. Simply select a date range to view exceptions. 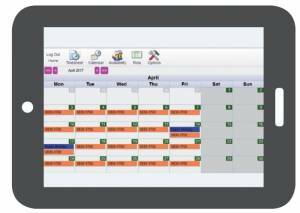 Supervisors are able to view and edit calendars, employee availability and absences. Timed downloads from clocking terminals can be set to run at any period down to a minimum of 5 seconds. Supervisors and managers can clock in or out one or any number of employees remotely. Timesheets: When an employee’s clocking in data has been collected it’s processed into net hours and can be viewed on the Timesheet screen. The Timesheet module takes the raw clocking times and applies the shift rules set up for each employee to calculate the net working hours the employee will be credited with. It’s simple to view and edit timesheets online. Exceptions management: Exceptions alerts users to anomalies in expected working patterns or activity. Exceptions can include missed clockings, worked unauthorised overtime, clocked in at a time that doesn’t match allowed shifts, etc. Simply select a date range to view exceptions. 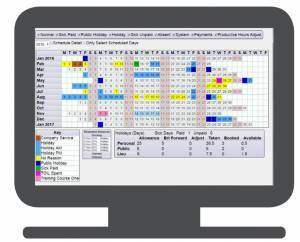 Calendars and availability: Supervisors are able to view and edit calendars, employee availability and absences. Standard rotas can also be viewed and edited along with daily, weekly and flexitime rules. Watch screen: Timed downloads from clocking terminals can be set to run at any period down to a minimum of 5 seconds. Multiple terminals on multiple sites can be programmed into the download scheme. The watch screen shows supervisors and managers who’s in or out in real time. Gang clocking: Supervisors and managers can clock in or out one or any number of employees remotely. 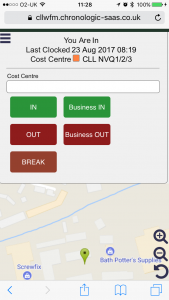 This feature can be used for gangs when the supervisor is the only person able to access the system while out on-site, for example Facilities Management, cleaning, construction and installation teams. Using our online service employees can clock in to the workforce management system using smartphones, tablets, Macs and PCs, (it’s optional, you can choose whether you want to allow web clocking). Web clocking adds flexibility for employees out on the road or working from different sites or offices. You can see exactly where they have clocked in from using geolocation. The workforce management system is available as an on-premise or managed cloud-hosted solution.